Amatrol’s Industrial Soldering Learning System (85-MT6BB) covers industrial soldering techniques commonly used within a control enclosure by industrial maintenance technicians. Applications for these techniques include soldering various connectors to wire, wire-to-wire, and wire-to-terminals. Other major topic areas include solder types, soldering safety, and tool operation. This industrial soldering training system requires Electrical Wiring (850-MT6B) and VFD/PLC Wiring (85-MT6BA). 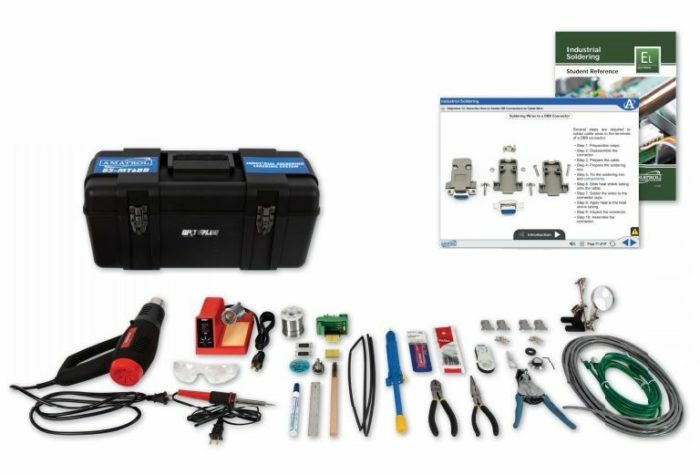 The industrial soldering training system includes a soldering iron, heat gun, potentiometer, burnishing tool, de-solder pump plastic vacuum, and more! These components will be used to practice skills like soldering and inspecting a connection on a printed circuit board and soldering a DB-9 connector to a Modbus cable. Amatrol uses real-world, industrial-grade components for its learning systems both for durability to stand up to frequent use and to allow learners to build confidence and competency with equipment they’ll actually use on the job. In addition to the soldering iron, heat gun, and burnishing tool, this learning system features a circuit board assembly LED, wire brush, heat sink clamp, wire strippers, pliers, and more. As an example of how these tools are used, learners first study how to how to solder DB connectors to cable wire and then will use the supplied tools to solder a DB-9 connector to a Modbus cable. Amatrol’s world-class curriculum combines vital theoretical knowledge with applicable hands-on skills in order to strengthen the connection between the ‘how’ and ‘why’ of important industrial topics. The industrial soldering training system’s included curriculum covers objectives like four types of solder, tools used for soldering, soldering safety rules, soldering bond inspection, and how to solder DB connectors to a cable wire. In addition to the included printed curriculum, Amatrol also offers all of these topics and skills in an interactive multimedia format. This multimedia features stunning 3D graphics and video, audio voiceovers of all of the text, and interactive quizzes and activities. The industrial soldering training system is just one expansion that can be added to electrical wiring (850-MT6B) to develop additional industrial wiring skills. Others include the required VFD/PLC (85-MT6BA) and the HMI Wiring (85-MT6BC). The VFD/PLC Wiring training system will cover how to wire a VFD and PLC to a control panel using industrial components like a Siemens PLC, terminal blocks, and an Allen-Bradley VFD. The HMI Wiring training system teaches wiring an HMI, analog wiring, and EtherNet cabling into a control panel mounted PLC. A sample copy of the Industrial Soldering Student Reference Guide is also included with the system for your evaluation. Sourced from the system’s curriculum, the Student Reference Guide takes the entire series’ technical content contained in the learning objectives and combines them into one perfectly-bound book. Student Reference Guides supplement this course by providing a condensed, inexpensive reference tool that learners will find invaluable once they finish their training making it the perfect course takeaway. Study and practice electrical wiring skills like: installing control wiring in an electrical panel; installing wiring into limit switches, solenoids, and pressure switches; and understanding the importance of correct wire size, material, and insulation.